I don’t know what is going on in our house. I rarely make sweets, especially in the summer time, but the past two weeks I have made two different desserts and two kinds of ice cream. Of course BL hasn’t complained, but it deserves some contemplation. I blame the insanely hot weather for making me turn to my ice cream maker more than usual. (And everyone knows that the best way to enjoy ice cream is over baked fruit crisp). Usually fruit salad is my dessert of choice during the summer. Sure, I love ice cream but I tire of it quickly and the thought of cookies and cake doesn’t get me that excited when it’s 104 outside. But baked fruit crisp? Suddenly all those thoughts go out the window. I went to the farmers market on Sunday to get ingredients for my salsa and couldn’t help but scoop up a few peaches and plums in the meantime. Who can resist that definite taste of summer, a ripe piece of stone-fruit? I love the addition of plums to a normal berry or peach crisp. The slightly sour taste from the plums balances any overly sweet pieces of peach. Did I mention I have been eating this for breakfast this past week? Mmm, I can’t get enough. Place chopped stone fruit into a large mixing bowl. Drizzle with maple syrup, lemon juice, flour and sugar. Lightly toss to combine. 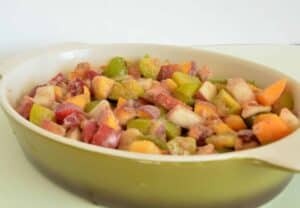 Place fruit mixture into a lightly-sprayed baking dish. For the topping, combine the flour, oats, chopped nuts, brown sugar and salt. Add in the oil and maple syrup and stir with your fingers or a fork. You want to create little clumps of batter to place onto the fruit. 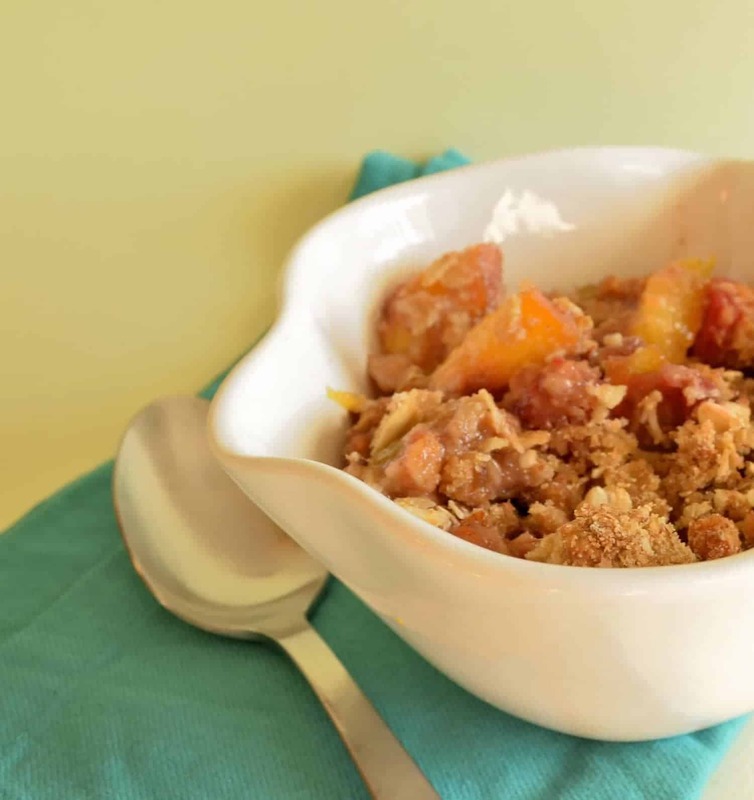 Using your hands or fork, place crumble topping onto fruit. Bake for 45 minutes at 350 degrees F.
Serve warm… with vanilla ice cream. I made some organic vanilla bean ice cream last Sunday to go with this and it was the perfect way to end the week.